Atheism, Morality, and the Rise of the "Nones"
Despite claims of professing atheists that their worldview is dramatically increasing in followers, they only account for 3.1 percent of the population in the United States in 2014, with 4.0 percent claiming to be agnostic. There is an increase in the "nones", people who claim no particular affiliation. (Globally, Christianity is on the rise, especially in countries where Christians are actively persecuted.) Some atheists consider the "nones" to be a victory for atheism. Not so fast, Freddie. 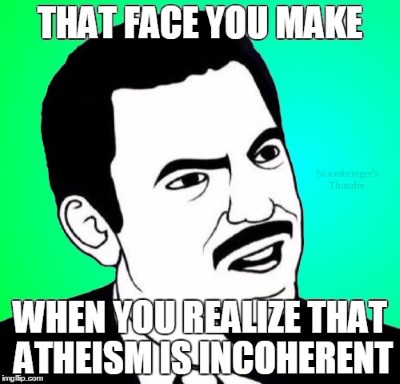 There are people who are unaffiliated with a particular religious organization, but that does not mean that they have renounced their faith and embraced the irrational religion of atheism. It does mean, however, that people are not joining up with churches, or are even leaving them because they don't like what their church teaches. In my case, I was raised in the liberal United Methodist Church, but that outfit chose to ride the Owlhoot Trail long ago, and has been going steadily downhill. Even my father who was a pastor there would not like the changes that are happening there now. (My beliefs are closest to Southern Baptist.) Some people have a difficult time finding a body of believers that is not emotionally-driven or apostate in other ways, so that doesn't mean the statistics support a pretended increase in atheism. For that matter, it seems that there are people who realize that "cultural Christianity" (being in a non-Hindu, non-Mohammedan, or non-whatever country makes one a Christian by default) is inaccurate, so they choose "no affiliation" on surveys, you savvy? People who ride for the atheist brand claim to have a higher ability to reason than Christians, which is ridiculous from the outset. Aside from observations of the behavior of militant Internet atheists, a study shows that atheists use less brain function than Christians, and another shows that they're more likely to indulge in irrational, superstitious behavior. When reading and hearing news reports, it seems that professing atheists are in favor of things that Bible-believing Christians oppose: persecution of Christians, abortion, homosexuality, transsexual behavior — indeed, atheism is rooted in selfishness, just like LaVey's version of Satanism. Not only do atheists have a faulty moral compass, their reasoning skills are sorely lacking. I reckon this supports Psalm 119:130, Proverbs 1:7, Jude 1:17-18, Psalm 53:1, 2 Peter 3:3-7, and other verses. One part of the problem is that they hate God and rely on materialism, denying the spiritual aspect of our being. I frequently encounter professing atheists to claim to have a high moral ground than Christians because of the money some preachers make. They are guilty of hasty generalizations on this, as well as double standards. Flock-fleecers posing as Christian ministers get stinking rich. Reports on income and net worth vary depending on which site you visit, showing people like Kenneth Copeland owning a huge mansion, private jet, personal airport, and making tens of millions of dollars. Is it more than a coincidence that the "pastors" who were under federal investigation were almost exclusively of the "charismatic" appeal-to-emotion gang? Yet so many times, we see comments from angry atheists as if those were typical Christian pastors, which is an example of over-generalization. Most pastors have serious financial challenges themselves, old son. Anti-creationists like to bash Ken Ham of Answers in Genesis and say how his organization "makes" millions of dollars. Some even say the money goes into Ham's pocket (such as this bigot). Is Ham making millions himself? No, those people are uninformed or lying. Ken Ham gets somewhere around $147,000 USD a year to run the outfit. Yes, heads of companies make money, but Ham makes nowhere near the amount of, say, the executives of Unitedhealth Group. When I point out that Clinton Richard Dawkins is worth $135 million USD, and it's expensive to join his "circle", there is no response or the subject is changed. Double standards and lack of actual reasoning are common among misotheists. Earlier, I linked to a couple of studies that are not helpful to atheists. Are they flawed? I suspicion they could be, since many studies are. A recent study said that religion is declining, but morality is not. How is that possible? Because the sidewinders who made the study loaded the terminology so that they defined morality according to their own purposes. Traditional values, especially those of biblical Christians, had no part of the survey. "Religion" is not declining, since the religion of secularism is increasing. No, people need to stop pretending there is no God and trying to replace him with evolution and secularism (Romans 1:18-23). The only salvation, the only hope, is found in repentance and faith in our Creator, not in the philosophies of man. There was a time when Europe was considered culturally Christian and missionaries were sent to the corners of the world from European churches. In those days, morality was largely governed by Christian principles and the church was the center of moral life. But those days are gone. Every year the number of self-professing Christians in European nations drops and more churches close their doors. Indeed, last year the former Archbishop of Canterbury warned that the Church of England is only “one generation away from extinction.” Secularism and Islam have seemingly replaced Christianity and, unless the expected trends change, will continue to do so in the years to come. I strongly urge that you read the rest of the article, found at "Study Asks, 'Does Morality Decline Without Religion?'"